Photo Courtesy of Ferndale Repertory Theatre. Photo Courtesy of Ferndale Repertory Theatre. Jessi Sheiman and Christopher Moreno. Some things go together so naturally we don't even question: cookies and milk or peanut butter and anything. Then there are combos that seem a mite odd at first, but ultimately prove delightful: chicken and waffles. I would place The Addams Family musical firmly in the second category. As someone who grew up on both the classic TV show and the movies, I admit I had my doubts about how the franchise would translate to the stage. How does a cast of necessarily dark and creepy characters mash up with a catchy modern musical? The answer is, at least for the production currently running at Ferndale Repertory Theatre, remarkably well. The musical, with music and lyrics by Andrew Lippa and book by Marshall Brickman and Rick Elice, manages to stay true to the original characters while engaging them in relatable circumstances. What would happen if dear, dark Wednesday Addams managed to fall in love with a completely normal boy? Why, she'd invite him and his parents over for supper to meet the family, of course. Hilarity ensues. Whether you are a fan of The Addams Family (the show, the movies or Charles Addams' original cartoons) or romantic comedies in general there is plenty to enjoy. Uncle Fester takes on the role of narrator, guiding the action and providing his own comic interludes. The music is surprisingly upbeat and catchy. I think this is the second morning I've woken up with the second act number "Crazier Than You" stuck in my head. There are also a few sweetly poignant songs, specifically Pugsley's "What If?" (sung well in this production by Aiden Vergen) and Gomez's "Happy/Sad." At over two hours, the production may be a bit long for younger viewers, however the humor is broad enough to appeal to all ages and it makes for a good family outing. This production is notable for having consistently strong vocal performances from everyone, although a number of performers certainly stand out. Christopher Moreno has created a wholly charming Gomez. His accent work is especially good, and he maintains it even throughout his musical numbers. Shaelan Salas-Rich also shines as Alice Beineke, the mother of Wednesday's beau. Hats off as well to Jaison Chand in his portrayal of Lurch — he deftly handles the challenge of creating a character who doesn't speak — and to Dimitry Tokarsky, who embodies Uncle Fester so naturally that he could have walked off the TV screen. Reen K. Savage, who plays Wednesday, feels a bit mature for the role, however it gives her a great opportunity to show off her vocal prowess. Jessi Sheiman is a reserved Morticia, fulfilling her role as the dominant matriarch and straight man. Kudos are also due to the members of the ensemble, a host of ghosts who enrich the stage without drawing away focus from the main action of the story. The ghostly costumes are particularly nice as the characters are distinct despite being monochromatic. There is no live orchestra for this show, which I would normally miss, but the music still provides a rich sound that keeps the mood lively. The set does an efficient job of recreating the creepy and kooky world of the Addamses without crowding the stage. If anything, there are a number of fantastic set pieces and props that you might like to see used more. Overall, Ferndale Rep has managed to craft a fun and funny show that is worth taking in. The theater is now under the leadership of new producing director Leira Satlof; if this production is any indication, I look forward to seeing what the rest of the 2014-2015 season has to offer. 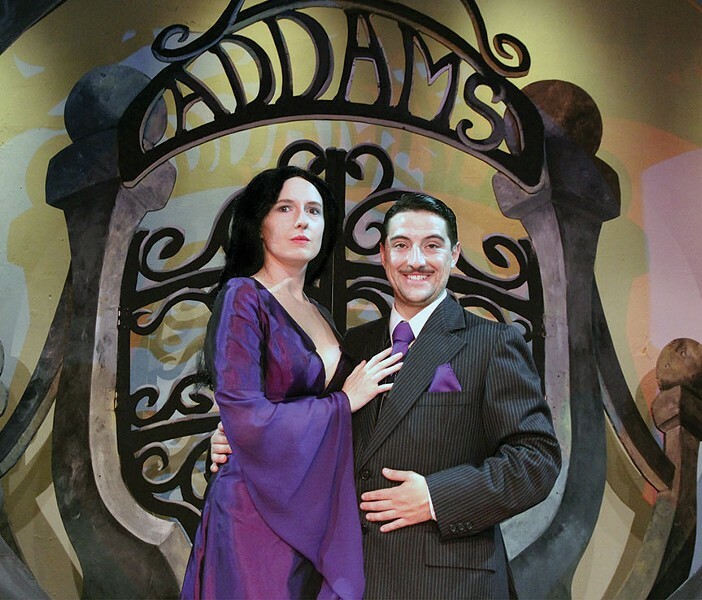 Ferndale Repertory's The Addams Family is artistically and musically directed by Dianne Zuleger. Dillon Savage provided support as assistant director. Choreography is by Linda Maxwell. The set is designed by Ray Gutierrez and costume designs are by Laura Rhinehart. The production runs through Oct. 26 with performances Fridays and Saturdays at 8 p.m. and Sundays at 2 p.m. A fun note: FRT is advertising an audience costume contest for the duration of the run. Come dressed as your favorite Addams for a chance to win a season ticket during the intermission of each performance. $18, $16 for students and seniors. 786-5483. More creepiness is on the way. Coraline, the eerie young adult novella from Neil Gaiman (he of the post-goth cult following), creeps into the Van Duzer Theatre on Oct. 16 and runs Thursdays, Fridays and Saturdays through Oct. 25 under the direction of Rae Robison. The young Coraline stumbles upon a seductive but sinister alternative version of her world and her family. This musical adaptation may be a bit much for younger children. Tickets from the Humboldt State University ticket office or at the door. $12-$17, $10-$15 students and seniors. 826-3928.